the six-cylinder DPL Hardtop sold for $3,312. 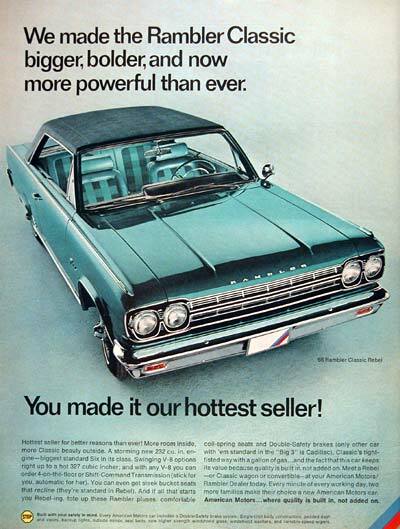 The winds of change blew mightily over American Motors in 1962. World president George Romney took a leave of absence from the corporation to explore his political options. Roy Abernethy replaced Romney at the wheel. Abernethy was salesman par excellence who had worked his way up the ladder at Packard by being that company’s best salesman. Lured away from Packard to flog automobiles for Willys-Overland, his successes on behalf of the Toledo-based firm led to a position as VP of Sales at American Motors. Abernethy was a natural leader because he had developed very strong, personal ties to the dealers. He listened carefully when they talked. 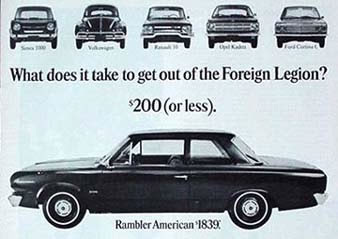 What Rambler dealers told Abernethy over and over was that they wanted bigger cars to sell. They were convinced that continental craze for compact cars was over. 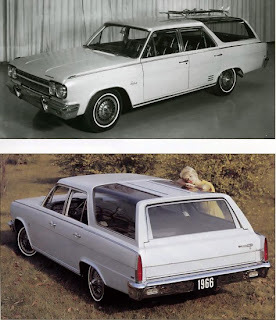 Rambler dealers were eating dust as consumers opted for larger sets of wheels offered by competitors. Figures from analysts within the industry bore that out. Romney was successful at politics and resigned from American Motors. Abernethy’s position was now permanent. Once firmly in the driver’s seat, the new president was quick to sell the board of directors on a radical new direction for the company. Armed with facts and figures, he convinced them that American Motors could not achieve its full market potential until the company offered a full range of automobiles. He further persuaded the board that the Rambler name was outmoded; that it needed to be downplayed and eventually retired in order to achieve its rightful corporate destiny. The changing of the guard would take place with the introduction of the 1966 models. To achieve that goal, a much larger Ambassador debuted for 1965. So did an all-new luxury fastback, the Marlin. 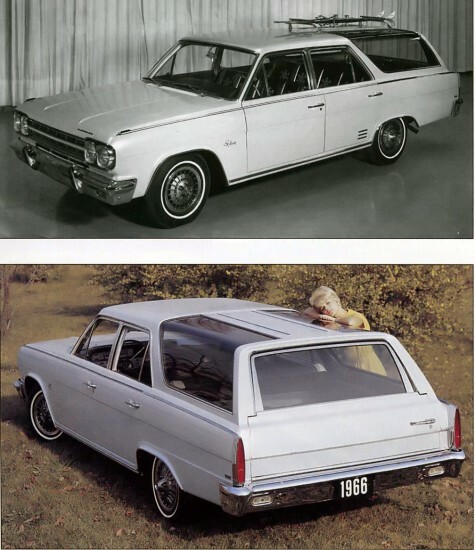 The 1966 Rambler line was truncated to include only Americans and Classics; Ambassador and Marlin were elevated from models to brands. Here at home, American Motors Canada, Limited followed suit, breaking out the Marlin and the Ambassador from the Rambler pack. Only seventy 1966 models had been built when workers in the Brampton, Ontario plant walked off the job in a wildcat strike. They wanted American Motors to give them a deal like their union brothers had in Windsor, Oakville and Oshawa. Wages rose from $2,47 an hour to $2.71 and included a 21-cent cost of living bonus that would be honoured throughout the life of the three-year contract. Pensions were increased to $225 a month, two more statutory holidays were added, for a total of ten a year. Workers were given ten days’ paid holidays after ten years’ service and four weeks after fifteen years. Life insurance, sick pay and supplementary unemployment insurance benefits sweetened the deal. Weary but satisfied union officials put the package to vote and workers returned ballots with 776 in favour and 96 against. When the new contract was signed, it matched what workers at Ford were getting in Oakville. This year’s homegrown crop of AM and Rambler passenger cars were given many extra touches not seen Stateside, all built into the base price. These included padded dashes, six seatbelts, backup lights, outside rearview mirrors and windshield washers as standard equipment. The Canadian Safety Council was mightily impressed and praised Brampton’s forward thinking. when equipped with the eight-cylinder engine. Promising “room to swing in,” the highly styled fastback offered four-on-the-floor for him and three-in-the-back comfort for her. Marlin could hold five adults in comfort or half a den of Cub Scouts—if there was no way out of it. The trunk boasted a capacity of 12 cubic feet. One could order the thrifty 145- or 155-horsepower Torque Command six-cylinder engine. For more speed, one could opt for the 198-, 250- or 270-horsepower V-8 mills. A three-speed manual transmission with an overdrive option was available or one could opt for a floor-mounted four-speed standard shift. An automatic transmission could be mounted on the column or on the floor. Now in its second year, Marlin offered oodles of extras so that “you can swing to your own tempo.” Reclining bucket seats, head rests, front and rear fold-down armrests-- unless one chose the centre console up front. Power steering, adjustable steering, AM-FM radio, rear speakers with Vibratone, All Season-Air Conditioning, power brakes, power disc brakes, power windows, Cruise Command speed control, electric wipers, a 4-Way Hazard Warning Signal, tinted glass, a Twin-Grip differential (great for banana-peel going) an electric tachometer and a black vinyl roof. The six-cylinder Marlin sold for $3,380 and the eight banger cost $3,535, f.o.b. Brampton, before the options were added onto the sales bill, of course. Having been restyled in 1965, this year the elegant flagship was simply refined. Advertising was quick to point out, “Suddenly there’s a luxury car that isn’t oversized, overweight and overpriced.” The 115-inch wheelbased beauty came with niceties not found in other vehicles, including a pair of matching throw pillows for the back seat. Though seldom seen, the most inexpensive Ambassador in 1966 was the 880 two-door sedan. The modestly trimmed sedan carried a $2,845 price tag and weighed in at 2,968 pounds. Offered exclusively in hardtop form, the top-of-the-line DPL cost $3,457 when equipped with the eight-cylinder power plant. The 990 series included two- and four-door sedans, station wagons, convertibles and a hardtop, all equipped with a six or an extra-cost eight-cylinder engine. The least expensive Ambassador was the 880 with modestly trimmed two- and four-door sedans and a station wagon. As perfect as it was, the lily could be gilded with all of the extra-cost items available for the Marlin, too. and the Rambler Classic 550 two-door sedan cost $2,575. engines in Canada. Sales for the calendar year hit 11,387 units. made the auto show circuit in 1966. The corporation’s traditional bread-and-butter line was the Rambler Classic. This year’s version was full of surprises. Perhaps the biggest surprise was that advertising compared it with Cadillac. The 232-cubic inch six-cylinder engine was standard. So was an acoustical fibreglass ceiling and a Ceramic-Armoured muffler. The convertible came with a flexible, scratchless glass rear window that didn’t need to be zippered in and out. A two-door hardtop Rebel led the Classic pack with its $3,112 price tag. The 770 family included a four-door sedan, a four-door station wagon and a two-door hardtop. 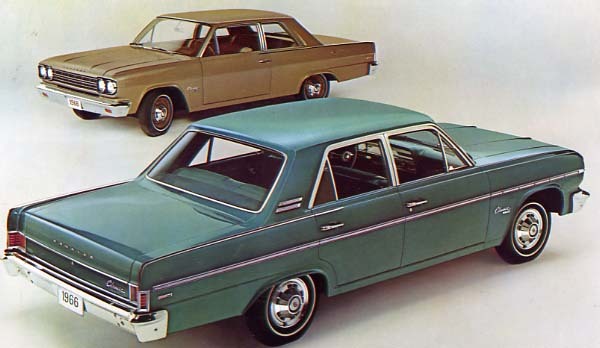 The low-bucks 550 series offered the only two-door sedan and included a four-door sedan and a wagon. Sitting on a pert 106-inch wheelbase, the Rambler American was the smallest of the company’s offerings. Smartly restyled and given the 232-cubic inch six as its base engine, a sassy new Rogue two-door hardtop was added to the line, selling for $2,620. Costing less, was the nicely appointed 440 series with a hardtop, convertible, station wagons, two- and four-door sedans. If the budget was of primary importance, the bare-boned 220 series competed with many economical imports. A stripped Rambler American two-door sedan sold for a mere $2,414, a four-door sedan listed for $2,392 and a four-door station wagon carried a price tag of only $2,798. Despite the rocky start, the season ended on a high note for the feisty independent automaker. Only five dealers had defected from the dealer body; there were 320 AM/Rambler dealers stretching across the Dominion at the end of the year. Domestic sales were off by 4,000 units but, because of the new Auto Pact Trade Agreement between Ottawa and Washington last year, production in Brampton was up to 32,912 units. Thanks for sharing! I have been a car enthusiast for the longest time and this helped me. Such an informative post! Thanks for your interest in American Motors. The last of the American independest American automakers is a personal family interests that goes back to 1926.